There might be some interesting albums from Google’s Picasa Web Albums photo sharing site which catch your attention and you intend to download for certain uses. For instance, your daughter from overseas has uploaded some family photos and informed you to download them. You need to register and open an account before you can start downloading your favorite albums. However, if you are not a regular user of this photo sharing site, it might not be so practical to register a new account just to download some albums. Managing too many accounts is always a tedious job for some people. In the event you are having this problem, probably it is worthwhile to try out Picasa Album Downloader, a simple downloading tool which allows you to download complete albums from the photo sharing site without registering as a user. 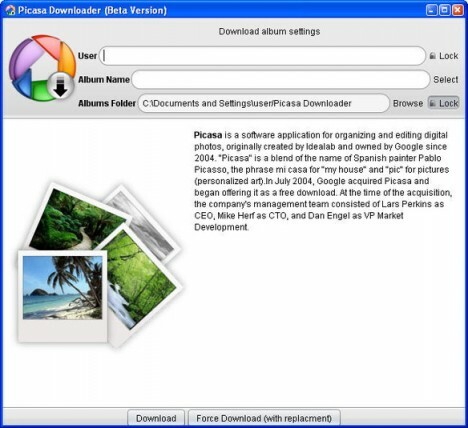 Compatible with Windows, Linux and Mac, Picasa Album Downloader makes things simpler and easier for users who need to download photo albums from the Picasa Web Albums site. Users do not require any installation but just have to execute the program and enter the user name as well as the album title they require. A single click to the Download button will get the task done. The downloader application will download all the images from the album to the designated folder immediately. Download the application via the link here. Picasa Album Downloader makes downloading from the Picasa Web Albums site significantly convenient for users. However, this tool doesn’t offer additional features such as image filtering and album browsing, which are quite important for some users.